The tuning of the antenna is accomplished by adjusting its resonant frequency to be in the region of the 156 to 162-MHz VHF Marine Band that will be used by the attached transmitter. The typical measure of the tuning is the minimum standing wave ratio (SWR) on the 50-Ohm transmission line used to feed power to the antenna. For ship VHF radiotelephone transmitters, the range of frequencies that are used is limited to 156 to 157.4-MHz, or the very low end of the band. For a standard ship antenna, the minimum SWR will usually be around 156.8-MHz (or Channel 16). For AIS transmitters, there are only two frequencies, and they are both at 162-MHz, or the very high end of the band. For a ship AIS antenna, the minimum SWR will be at 162-MHz. For an antenna designed to be useful for both AIS and ship VHF radiotelephone, the antenna will be tuned for some intermediate frequency, in the hope the SWR at both the low and high end of the band will be reasonably good. Also, the better antennas of this type are constructed with larger diameter radiating elements, which tend to increase the SWR-bandwidth. Fig. 1. 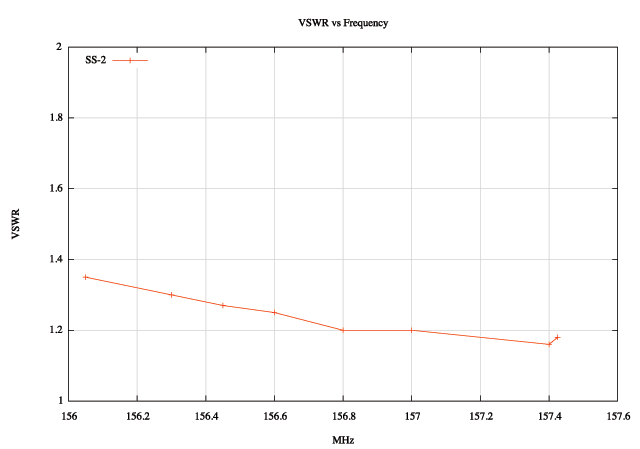 A plot of the measured SWR on the transmission line feeding an antenna tuned for the low end of the VHF Marine Band. The measured SWR is excellent across the entire portion of the band that the transmitter operates. Measurements and graphic by the author. The transmission line SWR is a consideration because many transmitters will reduce their power output if they detect the load they are trying to transfer power into results in an SWR on the transmission line of greater than 2-to-1 (hereafter 2:1). An SWR of greater than 2:1 generally indicates a problem has occurred with the antenna or the transmission line. For this reason, the antenna should be chosen to match the transmitter and the application, that is, use a standard antenna for a ship VHF radiotelephone transmitter and an AIS antenna for an AIS transmitter. For the now popular instance of having an AIS-receive-only device integrated with a VHF marine band radio, there is really no need to be concerned about the antenna SWR for the AIS receiver. An SWR of greater than 2:1 is not an impediment to receiving, in general, because all receivers have excess gain that will make up for any signal loss in the transmission line that occurs with higher SWR. the AIS transmitter and the VHF radiotelephone transmitter must share one antenna. It is impossible for two transmitters to share one antenna for simultaneous use. The typical installation on a small boat which attempts to use one antenna for two transmitters will employ a coupler that contains a fast acting relay which will detect the presence of a transmitting signal and switch the antenna only to that transmitter. Devices which perform this function typically cost several hundred dollars. A typical device is the em-trak AIS S300 Antenna Splitter, with a retail price of $299. This device gives priority to the VHF radiotelephone transmitter if both the AIS and the VHF radiotelephone transmitter attempt to transmit simultaneously. The use of a single antenna and a specialized antenna coupler to share one specialized antenna for both an AIS transmitter and a VHF radiotelephone transmitter is not an optimum solution. In my opinion, a better solution is to use two antennas for two transmitters, with each antenna tuned for the portion of the band it will be operating. The two antenna approach eliminates the complexity and cost of the special coupler, which should improve reliability. Also, in the event of a failure of the VHF radiotelephone antenna, the AIS antenna could be used as a back-up. Measuring the SWR bandwidth of a VHF Marine Band antenna is more or less impossible to accomplish by using a VHF Marine Band radiotelephone transmitter. Such a transmitter only transmits on the very low end of the band, so the SWR cannot be measured at the 162-MHz or high end of the band. Typically to measure the SWR on at AIS frequencies, an AIS transmitter is needed, and the transmitter must have an internal directional wattmeter that can be read and interpreted for SWR by the user. In regard to how to measure the SWR-bandwith of a VHF Marine Band antenna using a ship VHF radiotelephone transmitter, the range of frequencies the transmitter can be operated on is limited. Below is a list of suggested channels to use for testing antenna SWR bandwidth. These channels have been chosen because they can actually be transmitted by a VHF Marine Band radio set ot the USA band plan. Because 157.400-MHz is the highest frequency that a ship VHF radiotelephone transmitter can operate, measurement of an antenna's SWR at AIS frequencies with such a transmitter will be impossible. As can be seen above, SWR measurements can only be made at the low end of the band when a ship transmitter is used, and there will be no way to know how a particular antenna behaves at AIS frequencies without specialized equipment to actually measure the antenna.